Regardless of the specificity, longevity or demands of your course, the Nottingham Advantage Award is for you. Of course, who am I to say this scheme of incredible employability opportunities is right for you? That being said, here is why my experience proves the Award offers more value for your time than you think. I was an overly keen fresher, looking for ways to fill my time with all that Nottingham had to offer. After browsing which facets of the student lifestyle were best suited to me, I hesitantly applied for a module under the Advantage Award programme. Hoping it would not conflict with my timetable, social life or hall dining hours. Food = life. It was spring term of my first year, living in Newark Hall on Jubilee Campus. Thankfully I was accepted for the Consultancy Challenge module on my home campus. I was able to coordinate my days of alternating between University Park and Jubilee so I did not have to miss my catered meal times. Happy belly = happy brain. But did my social life survive, too? My course-mates and flatmates were intrigued by my interest in the module – despite me never having shown an interest in consultancy. As I explained the module to them, I quickly realised how its scope was beyond the realm of any of our current “freshers” frame of mind. The Consultancy Challenge was a collaborative effort between myself, my team – postgraduate students of varying backgrounds – and our client – Romax Technology. The project was deeply engaging and I got to use my digital media skills whilst researching the current market of electric vehicles. By working with a team of varying degree levels, I was able to find where my strengths lie, collate our research and present our findings in a visually appealing format. Enthused by my fulfilling Advantage Award experience, I sought other ways to earn credits in my second year. I enrolled in two modules that accredited roles I already planned on doing alongside my degree. Both the Peer Mentoring in Cultures, Languages and Area Studies – CLAS – and Societies, Sports, and Student Run Services modules allowed me to fulfil my final 20 credits needed to complete the Award. Not only was gaining credits for my non-academic work convenient, but it trained me to reflect on all my extra-curricular activities in a “curricular” way. Rather than being stuck behind the pages of a book or a blaringly bright computer screen all day, I was interacting with people. This opportunity to build relationships with my peers, departmental staff and Student Union mentors was the most rewarding aspect of my Advantage Award journey. Often we feel as if an Arts degree is less compatible in the “working” world. Yet, it is entirely the opposite. With my innate interpersonal skills, I was able to set the right tone of communication between my consultancy team and our client. During the peer mentorship, I imparted my top tips to ignite the interest of previously disengaged CLAS “freshers”. Finally, amidst the blur of numerous Student Union roles, I tested my personal limits – building upon my negotiation, publicity and event planning skills. 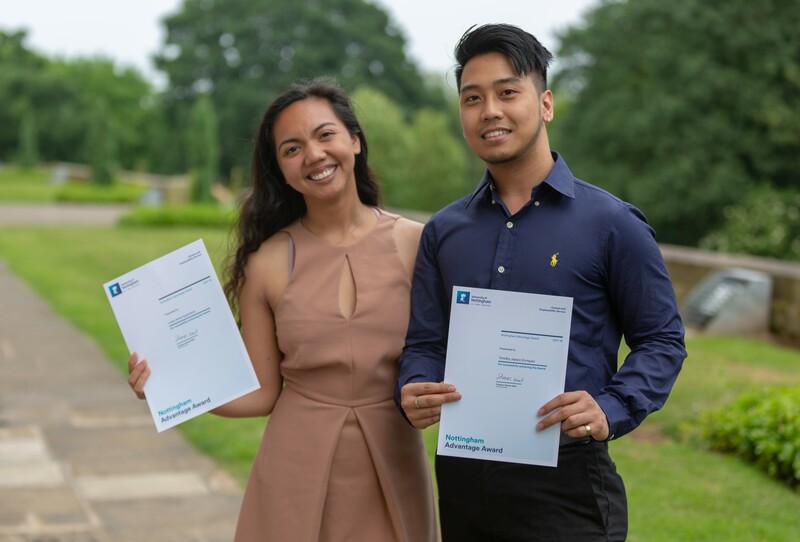 While the Advantage Award required effort, I found the overall experience flexible with my course and I enjoyed how my time was utilised in a productive manner. I now find online placement applications less tedious, language learning less daunting and interacting with people a much more genuine exchange. As I progress through my final year, I now realise the Advantage Award was never just about increasing my employability prospects. It also helped me understand the potential my International Media and Communications degree has in leaving a lasting impact on the world. Spring term modules such as the Nottingham Consultancy Challenge are now open for applications.